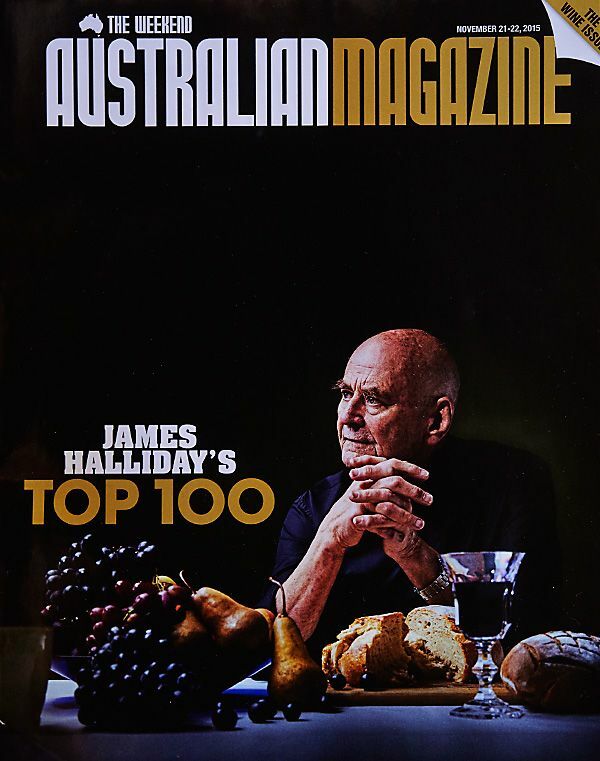 James Halliday’s ‘Top 100 wines’ were released recently. In a covering piece on this years list he made comment on the quality of today wines compared to that of 30 to 40 years ago. 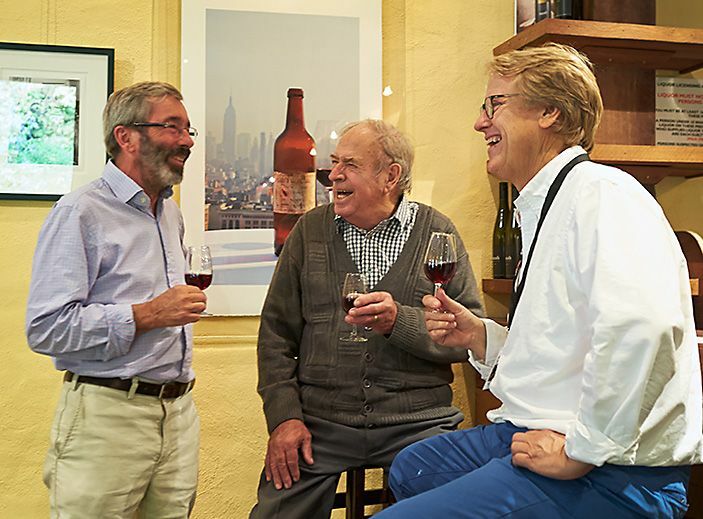 ” I have had the privilege of tasting today’s 40-year-old wines since they were newly bottled. Not every one, of course — far from it. But a cross-section of representative wines, yes. With an interest in fine wine that stretches back well over 50 years. James can draw on many years of wine tasting knowledge. I have known him since the mid 80’s when we were both involved with Australian’s National Daily ‘The Australian’. 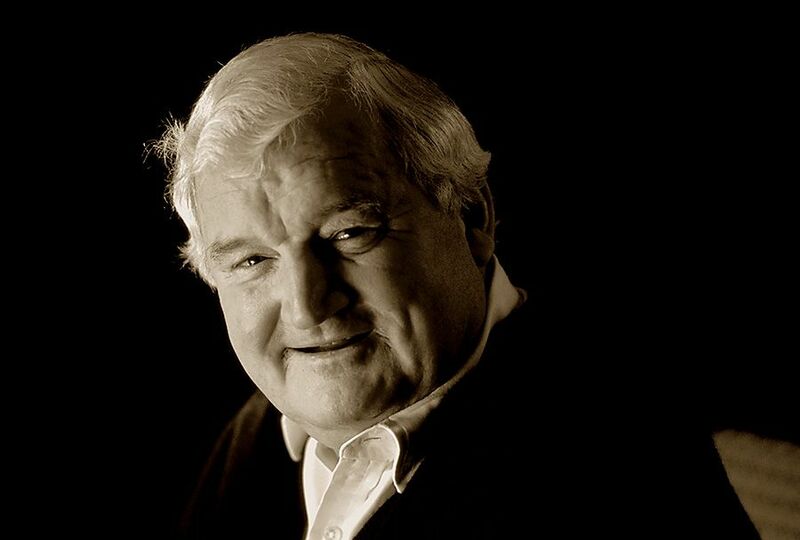 He is the biggest selling wine author in Australia and is undoubtably the doyen of Australian Wine writers. My interest in wine began in the years immediately following the Second World War. 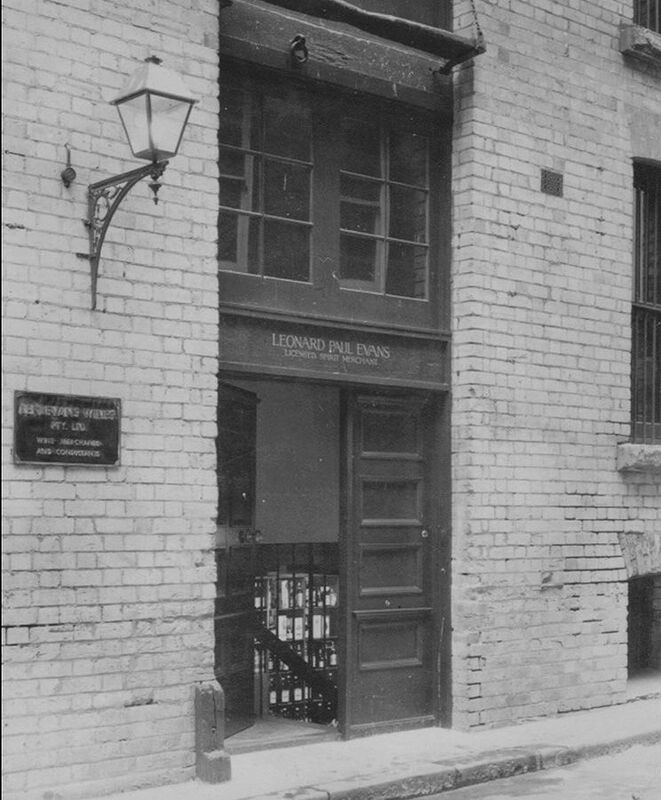 My father John was a heart specialist who lived in England with my mother in the early 1930s while he studied for his ‘Fellow of the Royal College of Physicians’. While in England my parents were exposed to good French wine. They liked it so much that when they returned to Australia my father built a walk-in underground stone wine cellar. Little did I know, in the latter part of the 1940s when I was appointed a semi official butler at home, where I might one day end up. When we were to have wine at home, which was by no means every day, I would be told what was required and it would be my job to fetch the bottle from the cellar. Whatever wine was served, I was given a small glass. I maintain that it was diluted with water, something that in later years my father always denied. 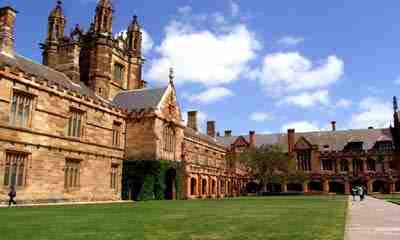 In 1956 I became a resident of St Paul’s College, University of Sydney, embarking on an arts-law degree. Most of the time I spent the maximum amount of time enjoying myself and the minimum amount of time needed to scrape through the end of the year exams. While there I discovered the College had a formal Wine Cellar run as a cooperative. The cellar had wines from many makers notably Penfolds and Tulloch. My wine horizons were expanded overnight. There was also a Wine Club which made weekend day trips to the Hunter Valley, this really started my interest in the Hunter. Looking back, the six years I spent at St Paul’s college were the happiest, most carefree of my life. You started your wine career while a partner in a large national law firm, how ? The three years as an article clerk at Clayton Utz coincided with the last three years of my law study. Early in 1962, I completed my articles and announced my intention to go overseas for the remainder of the year. I was told by the firm there would be no job for me when I returned, I thought that was the best news I’ve heard in ages and it removed any lingering obstacle to my trip. Despite the warnings before I left, I found there was a job for me after all when I returned. 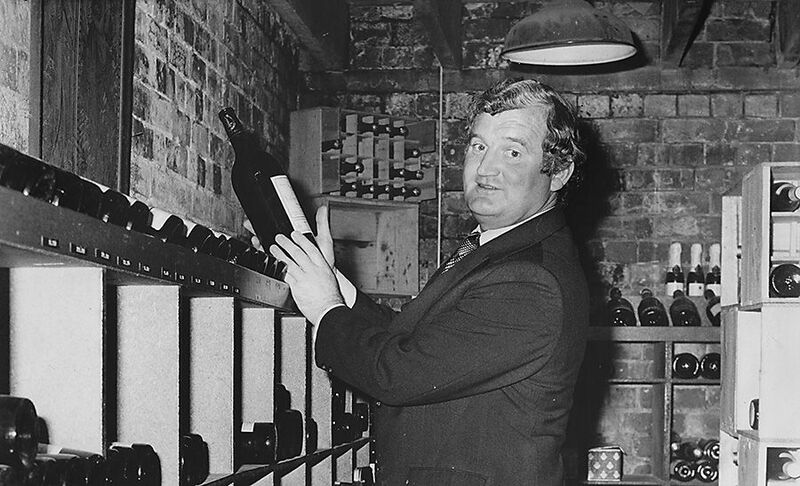 Len Evans in his Bulletin Place cellar : Photo Supplied. Around this time Len Evans had become Australia’s first regular wine columnist with his ‘Cellarmaster Says’ column in the Bulletin Magazine. Len was Food and Beverage manager at Australia’s first international hotel,the Chevron, in King’s Cross. In my last years at university I had been a client at the hotel, often arriving with college friends to descend on something never before seen in Australia a fixed-price, self-serve, smorgasbord lunch which allowed you to eat as much as you possibly could. In our case ,that was usually an indecent amount. This was a period of great change for the wine industry, my involvement in it and for me personally. I was certainly doing my bit to help sales along. By the time I was married in April 1969, I had mini cellars stretching from Sydney to Moss Vale. In April 1968, Len Evans published the first issue of ‘The Wine Buyer’. I remember in an early issue he compared the 1962 Chateau LaFite, a wine which cost something over $9 a bottle here (yet it cannot be called expensive Len noted) and a 1962 Grange Hermitage. 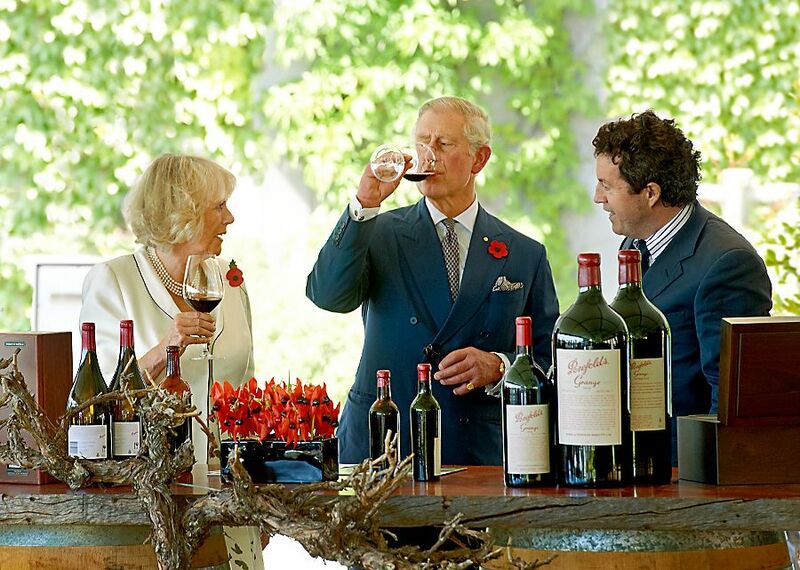 He wrote the 62 Grange is also a bit expensive, but fairly priced. He thought it was very much worth the money and at $2.40 an extremely good value. Me and two lawyers (and wine lovers) were becoming very interested in French and German wine, we were also heading off to the Hunter regularly in search of land to plant a vineyard and erect a winery. My reason was simple. Big-city corporate law firms can easily suffocate all life and activity outside one’s law office. Owning and operating a vineyard and winery would have the degree of necessity of every weekend work, and thus a break from the demands of law practice. 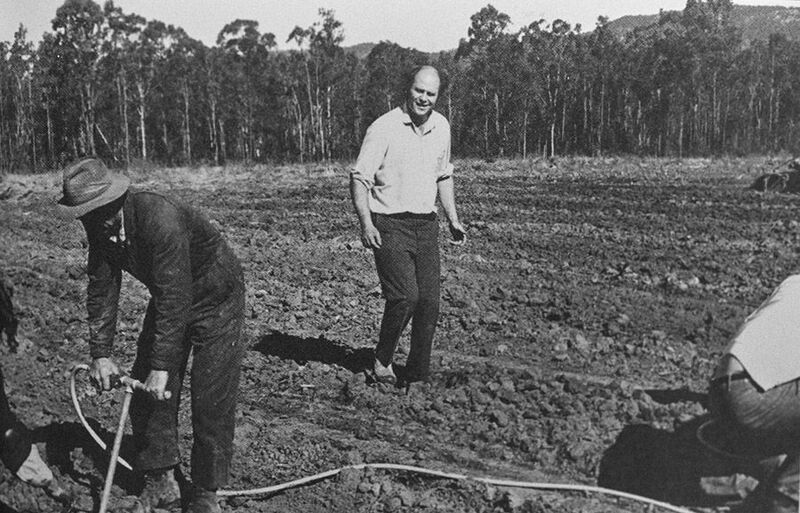 We bought a 10 acre parcel of land in McDonald’s Road, Pokolbin, During the summer months of 1971 the land was cleared of a forest of stringybarks and planted later that year. We called it Brokenwood. Time, it is said brings perspective, heals all and it does a great deal more. Forty years have done nothing to dim the agony I felt at the end of the first days planting. Miraculously the vines grew and grew well, our strike rate was about 95%, which was very good. 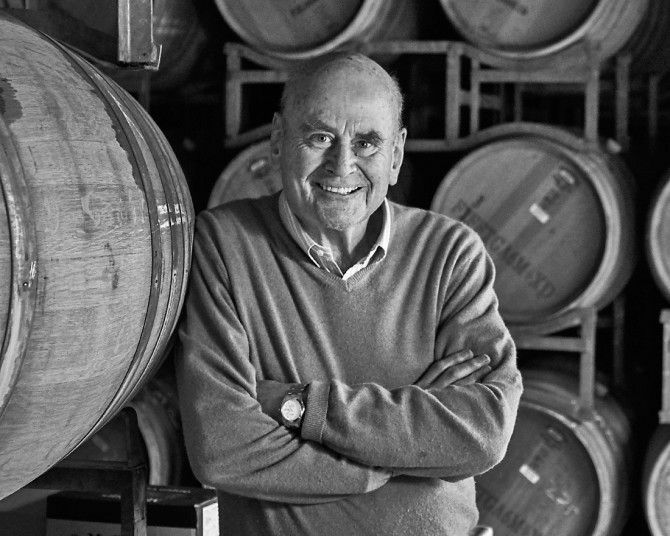 Brokenwood continues as a highly regarded winery with continuity in its expanded ownership, but I sold my share when I moved to Melbourne and could no longer actively support it operation. 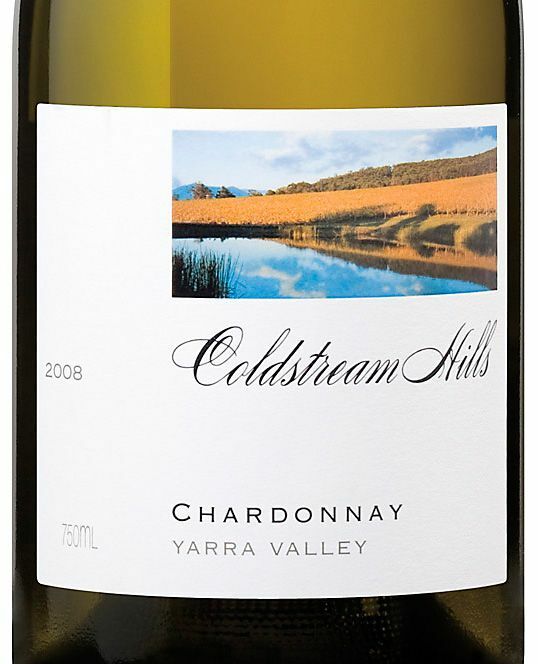 In 1985 you moved to the Yarra Valley wine region and established Coldstream Hills. Why the move ? I had been a partner with Clayton Utz since 1966, and relocated to Melbourne to open its Melbourne office. Suzanne and I moved there in mid-1983 and rented a house in South Yarra. It was my intention to stay there until mid 1988 and retire just prior to my 50th birthday. James and his lifelong friend Michael Hornibrook, jointly shared their 50th birthdays. Moving our personal possessions was no problem, but moving the 15,000 bottles of my wine cellar most certainly was. We decided to try to move it ourselves, hiring a 1-tonne trailer and filling it with 1.5 tonnes of wine boxes blithely assuming my Rover 3500 would be able to easily deal with uphill stretches without undue loss of speed. That was a bad miscalculation, the trip agonisingly slow. That was the end of that, and a professional removal company was hired. 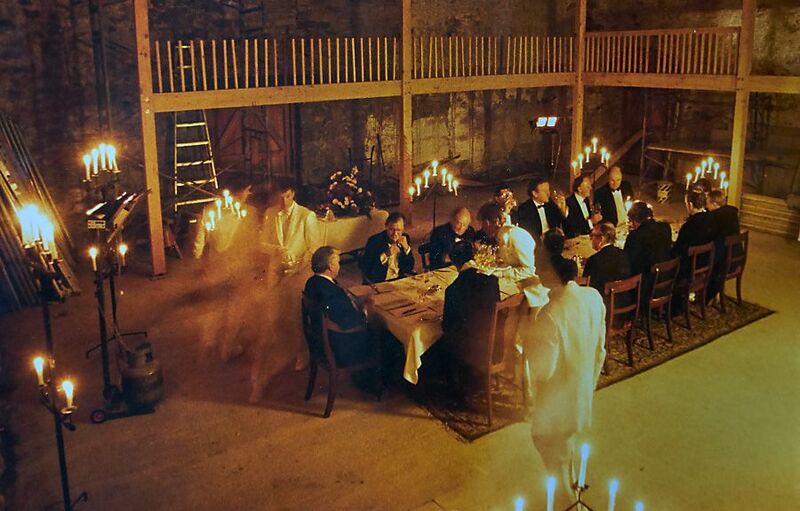 The Sydney cellar was in self storage, with single bottle weld mesh fixtures running the entire length of the four walls; the Melbourne cellar-to-be was nigh-on identical. The boxes were unloaded into the centre, with just enough room to skirt around the outer edges of the pile of boxes and keep within the bottles to be placed in the mesh. The first box was opened, and had 12 unrelated bottles in it. Strange, I thought. Box 2 gave rise to the same result, and a nasty thought started to form. Box 3 confirmed the worst. Jame’s cellar, well orgaised now : Photo Supplied. 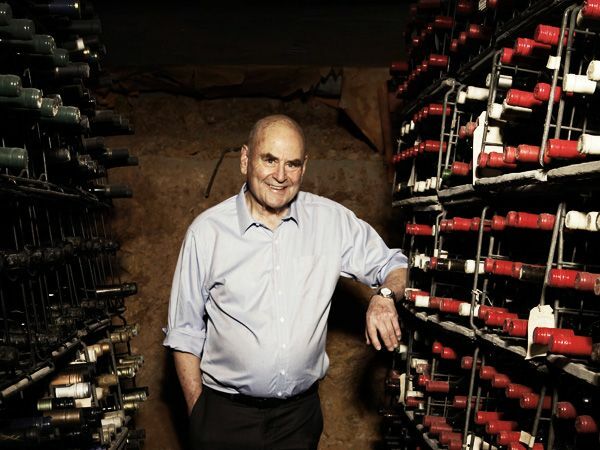 In Sydney the wines had be arranged in vertical rows, but the removalist crew picked them horizontally, resulting in an alphabet soup of monstrous proportions. I tried to help where I could, but it was Suzanne who spent countless hours trying to sort the bottles into some semblance of order. Two-and-a-half years later it was moved for the last time to our house, never (in my lifetime, anyway) to be moved again. I had intended to partially overcome the financial hurdle of early unfunded retirement by making wine from contract grown grapes in a rented space in someone else’s winery. I had also asked a few people to keep an eye out for any suitable properties for sale along either Maddens Lane, Briarty Road or Hill Rd. 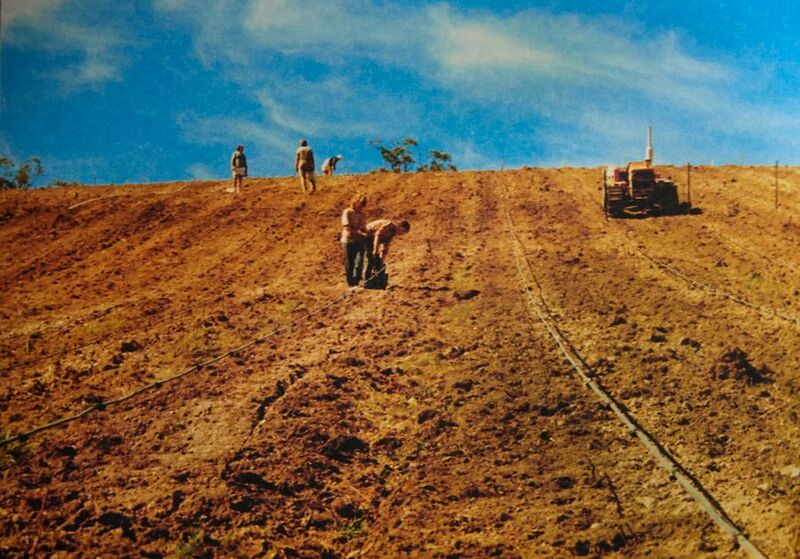 Establishing the Pinot Block at Coldstream Hills : Photo Supplied. 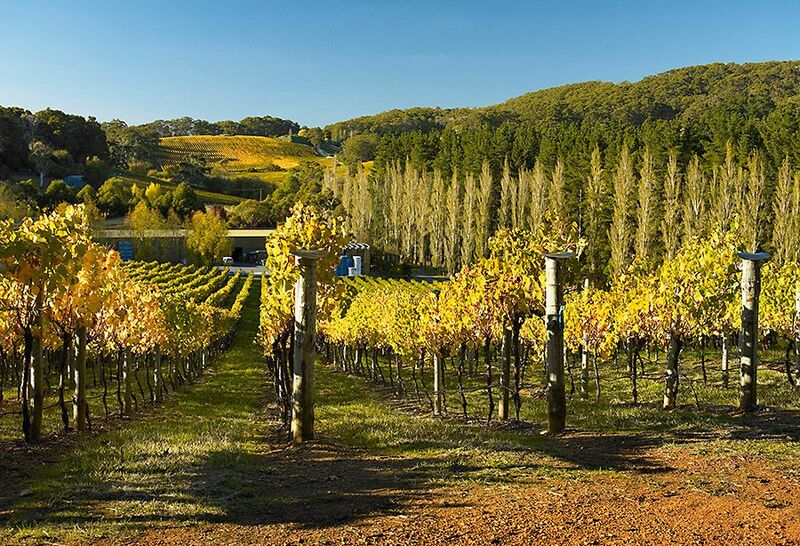 As a quick digression, I should explain I chose the Yarra Valley in preference to the Mornington Peninsula simply because it had been established longer, its performance as a wine region already established by wineries such as Mount Mary, and its physical beauty. The Peninsula was in an early stage of its development, its potential still to be confirmed. Late in the winter of 1985, neighbour Jack Church of Warramate winery told me an Auction sign had gone up on a nearby property. Tony Jordon, Suzanne and I looked at it. I made an offer that weekend and bought it for $240,000. I was in negative net worth territory following my divorce but I organised a loan of 130% of the purchase price, giving us some extra funds to plant a vineyard. 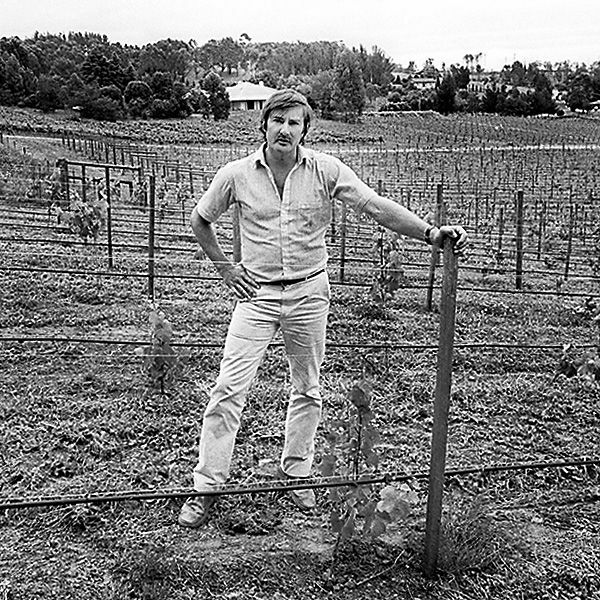 Brian Croser in the very young Tiers Vineyard 1983. Photo : Milton Wordley. The vineyard layout on the steep slopes was designed by Brian Croser with input from McLaren Vale grower David Paxton. David had helped Brian plant the Petaluma Tiers vineyard at Piccadilly Valley in the Adelaide Hills. Out of the blue, and with no prior ‘bush telegraph’ warning, the property adjoining the northern border of the Coldstream Hill block came on the market for sale. We had always said that if it was offered, we would have to find the money to buy it. Its house had a largely open lower level which is today’s cellar door, and over 10 hectares of pasture which was clearly perfect vineyard land, Warramate adjoining its northern border, with Yarra Yering in turn adjacent and completing what might be described as the Yarra Valley’s Côte d’Or. Tapanappa Tiers Vineyard today. Photo : Milton Wordley. I had three choices: defer my retirement from Coldstream Hills (I was then not quite 50) and borrow the funds from Westpac; obtain financial backing from private individuals; or make an IPO on the second board of the stock exchange. James is also a keen photographer. many of his images are on the Coldstream Hills labels. We chose the latter course, but in between the time of completing the purchase and completing the IPO [Initial Public Offering] the great stock market crash of October 1987 took place, and Coldstream Winemakers Limited (as the business was then known) was the first company to list on the Australian Stock Exchange after that crash. The decision to leave the substantial economic shelter provided by my partnership in Clayton Utz had major financial implications. People were later taken aback at times when I would say that I divorced my wife and married my mistress …before I explained that law had been my wife wine my mistress. Our first vintage was in 1985. We had significant successes in the Show circuit, but success in wine competitions and great wine diners was one thing, making any money another. By the early 1990s Australia was plunged into the Recession it had to have. In turn the market for super premium wines shrank dramatically; we reduced our prices and sales were good, but not the prices we were forced to accept. It was very tough for quite a few years. Coldstream Hills in Winter. Photo : Milton Wordley. In 1995 BRL Hardy made an indirect and tentative approach to acquire Coldstream Hills. I firmly rejected it. I had been in discussions with Petaluma and these continued. This all changed one Saturday morning in May 1996 . I was sitting in my office getting ready for a trip to the UK leaving the next day, and Southcorp CEO Graeme Kraehe called to say that on Monday morning Southcorp would be announcing a takeover offer for Coldstream Australasia Limited at 96 cents a share. Bankers Trust was appointed to advise Coldstream Hills, and lengthy discussions followed, ultimately resulting in an increased offer of $1.06 per share. With the greatest reluctance, Suzanne and I decided to accept the offer for our own shares, and the Board recommended the offer. When the dust settled, we were given the opportunity to buy the house we had lived in since 1985, high on the hillside with House Block Chardonnay literally providing our front garden (Barossa Valley vignerons throughout the 19th century described vineyards as gardens) and the 1988 plantings running further down the hillside, the whole of the Yarra Valley spread out thereafter. Later that year I was appointed Group Winemaker for Devil’s Lair in Margaret River, Lindemans, Hungerford Hill and Tulloch in the Hunter Valley, and (of course) Coldstream Hills. This continued until 2000 when it was decided I should retire as Group Winemaker but continue my role as consultant to Coldstream Hills. My attitude to Coldstream Hills has never changed, and never will: it is my baby, and I have the same feelings for it as I did when Suzanne and I owned 100%, thereafter 51%, then 26%, and zero once the takeover was completed. My ashes are to be sprinkled over the House Block. James and Len Evans. Photo supplied. Len was a major influence in my life. 16 August 2006 my world changed forever. The night before I and several other mutual friends had dinner with Len Evans at the Evans family house ‘Loggerheads’ in Hunter Valley. The next day when I landed in New Zealand with a bunch of wine journalists to attend the rugby test between the Wallabies and the All Blacks. Stuart Gregor, a consummate PR operator in the wine arena and a long-term friend, met us at the airport with the words, ’James I’m so sorry, but Len’s dead’, I wanted to say he can’t be…I was with him last night. What started as a friendship 35 years earlier grew into something much more than that, transcending respect morphing into unconditional love. Looking back I’m not sure precisely how long it took, nor whether there was any particular event that caused me to realise how deep our bonds were. The book : ‘A Life of Wine’. I had written my book ‘A Life in Wine’ before he died, and it was about to be printed. So I made the first chapter about our relationship. He was not well understood by some who thought that he had a huge ego. He didn’t have an ego in the normal sense of the term, but was certainly very sure of his beliefs, and he could be very unkind to fools. He was frequently accused of favouring the Hunter Valley. That in my opinion was the most untrue thing of all; what he wanted to do was support the whole Australian wine industry. The fact that he had founded Rothbury in the Hunter Valley was because purely and simply it was the only region accessible from Sydney. In fact his first wine experiences were in the Hunter, in the early days. 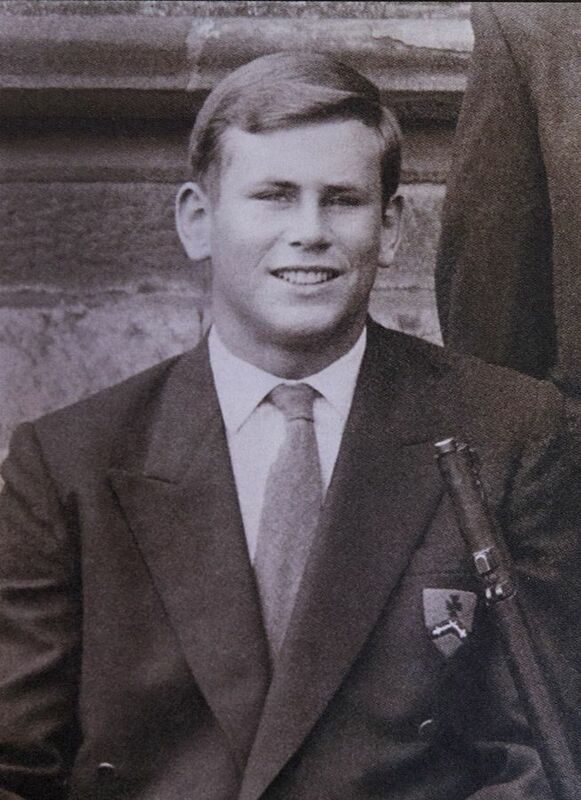 He worked for the Wine and Brandy Association of NSW before he started Bulletin Place in1967. 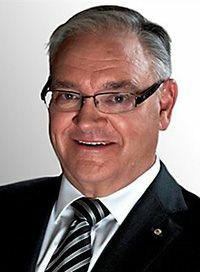 He was a tremendous force for the good in the hospitality industry in Australia , a great after-dinner speaker with a very wicked sense of humour. He was well known for his appreciation of the female form, and always worked on the principle of if you don’t ask you don’t get. You are a member of the Single Bottle Club. Does it still meet and who are the current members ? Len Evans Wines Bulletin Place, Sydney : Photo Supplied. We had the early dinners in his Bulletin Place restaurant. It was effectively an organic evolution that came out of those wine dinners. Yes, the SBC still meets annually. I am the only person to have been to every one of the dinners. 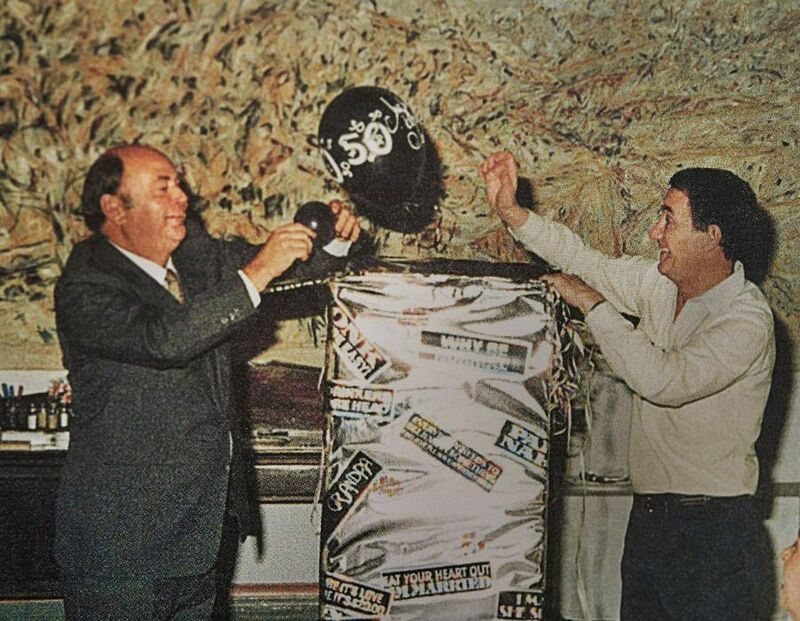 The first was held in 1977 it was Len Evans’ idea. It became known as the Single Bottle Club: it was basically a group of friends, a group of wine nuts I suppose you’d call us. Everyone had to bring a great bottle of wine; it was often a bit like herding cats, we tried to get people to bring along not only a great bottle, but a compatible wine with the others so you could put them into sensible brackets. Moreover, there was no way one bottle per head was going to be enough, so those of us with better cellars bought along an extra bottle, I think we started with 20 bottles for 12 people We really had a Pandora’s box of very great wines we could pull out and share. There were great wine dinners. Single bottle club at the Bridgwater MIlll 1986. Photo : Peter Fisher. 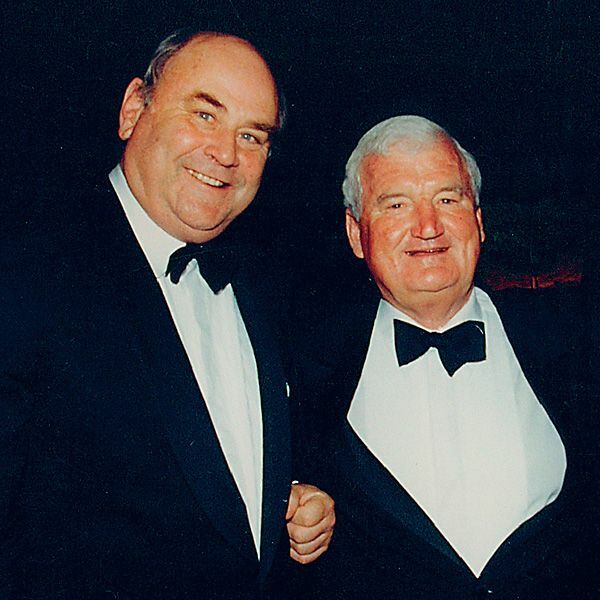 Michael Broadbent flew out from England to specifically attend the first SBC Dinner, bringing with him a bottle of 1825 Chateau Gruaud Larose, and then Prime Minister Malcolm Fraser was a regular attendee at some of the earliest dinners, one of which was held at The Lodge in Canberra. 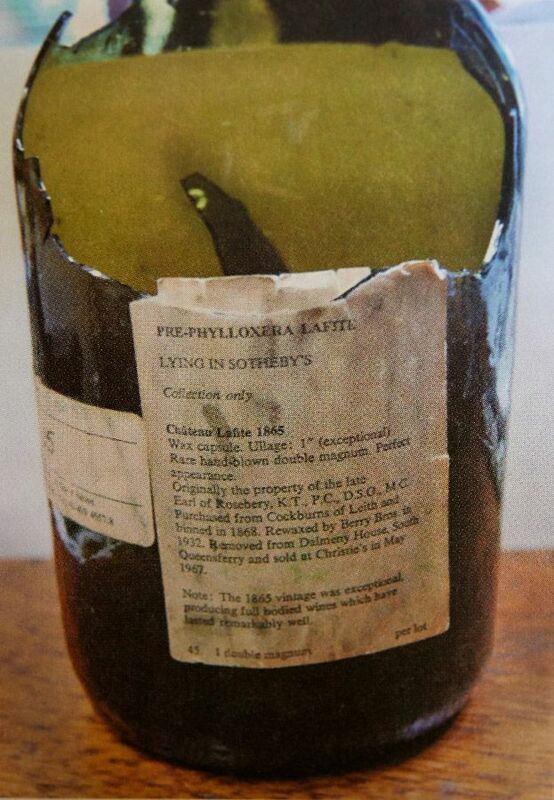 The remains of the accidently broken double magnum of 1985 Chateau Lafite : Photo Supplied. Over the years some extraordinary wines from the 19th century have been featured, another with 60 vintages of Chateau Latour which necessarily morphed into a two-day event, with a sequential lunch/dinner, lunch/dinner format, the lesser vintages served at the two lunches, the greatest younger vintages the first night, and the greatest vintages on the final night. Another dinner featured over 10 vintages of Romanée-Conti, and there had been two La Tâche dinners with 15 to 20 vintages each. Then there were occasional headline bottles such as 1727 Rudesheimer Apostelwein from the Rheingau, and a 1646 Tokaji from Hungary. The Penfolds Flight (1955 Grange, 1962 Bin 60A, 1967 Bin 7 Coonawarra Cabernet Sauvignon Magill Shiraz, 1971 Grange), the Hunter Flight (1952 Mount Pleasant Light Dry Red Stephen Hermitage, 1959 Mount Pleasant Rosehill Hermitage, 1959 Lindemans Bin 1590, 1963 Lindemans Bin 3110), and the Seppelt Flight (1961 Moyston Claret, 1962 Great Western CH20 Burgundy, 1963 Great Western Hermitage T114/115, 1967 Great Western Colin Preece Memorial Burgundy). 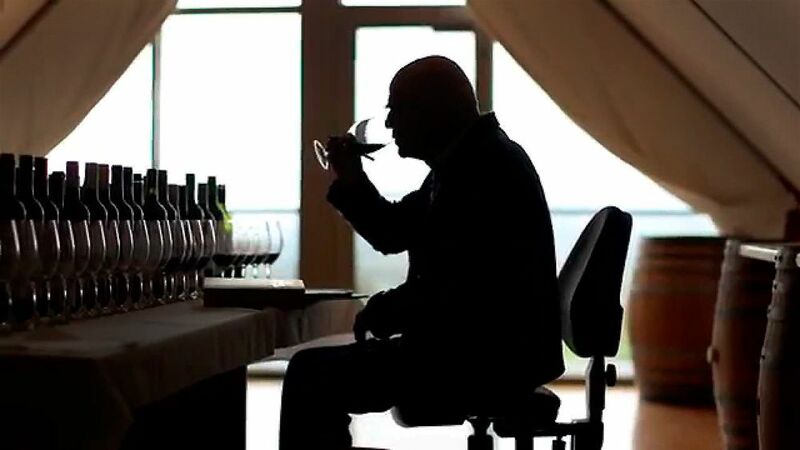 You have been a very influential wine judge and chairman of judges at many regional and capital city wine shows. 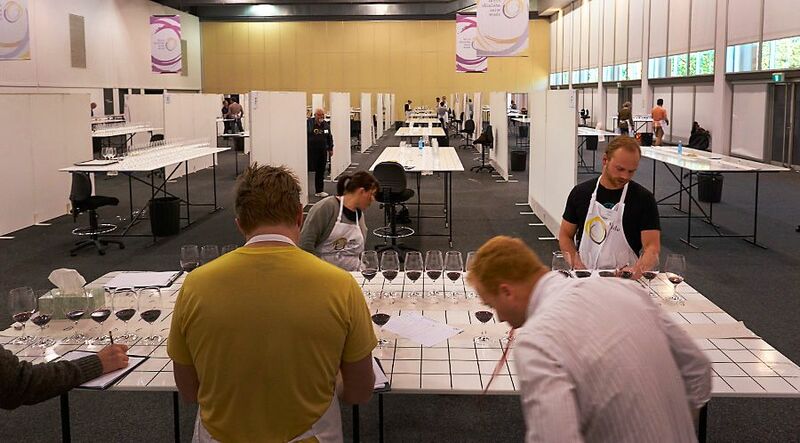 How do you think the show circuit fits into the Australian wine scene, and do you have a favourite show ? Over a period of 30 years I moved up from associate judge, to judge, to panel chair (of three judges and 3 associates), and ultimately to Chairman of Judges. My favourite show was for various reasons the National Wine Show staged in Canberra, where I served two separate periods as Show Chair. When I turned 70 seven years ago, I retired myself. I’m a fervent believer in the value of the show system because of the way it has trained and educated Australian winemakers to never accept anything as unchangeable truth, to never become complacent and hence to seek to make better wines than ever before. It’s a merciless environment around the judging table. Each judge has to be prepared to explain precisely why his/her points were different to those of the other two judges (particularly at gold medal levels). In retrospect, prior to the arrival of screwcaps, we accepted the need to call for second bottles at the preliminary judging of wines that we recognised as faulty, simply calling for a second bottle to see whether it was a cork-related issue or not, and, if it was, happily point the wine on the basis of the second bottle (if it was better). 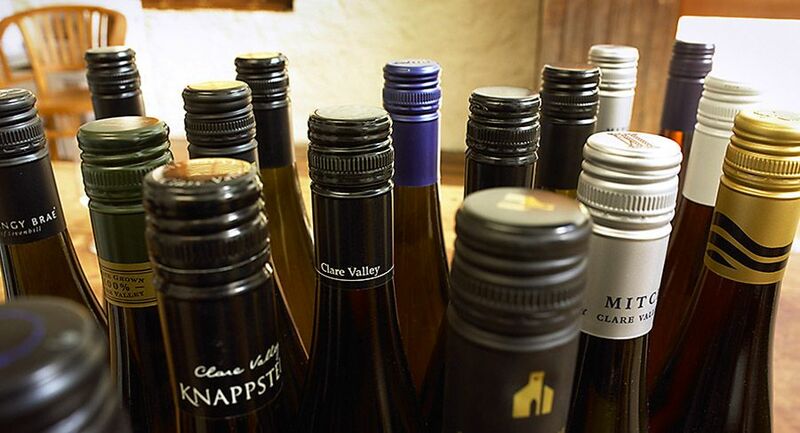 Clare Valley Reisling Screwcaps. Photo : Milton Wordley. The same thing could then reoccur at the trophy judging level, where a second bottle could be called for, and the wine ultimately receiving its trophy with 50% of the wines tasted at the show being faulty. The issue could be cork taint via TCA (trichloranisole) imparting a musty smell and/or taste, but (particularly in the case of white wines) more frequently oxidation. Stephen Henschke who although he didn’t judge in wine shows was onto another issue for some considerable time. Stephen Henschke, the late Peter Lehmann and Robert Hill Smith. Photo : Milton Wordley. He kept on talking about the taste of cork in the wine. Now he didn’t mean cork taint, he meant uninfected virgin Cork, and it does have a flavour. And why wouldn’t it have flavour, It’s the bark of a tree. Putting TCA (corked wine) or barky/woody issues aside, the other big lesson we learnt from screw-caps was oxidation, or premature oxidation. Before that we just accepted it; you rolled with the punches with wines like the old Lindeman Semillons. We accepted them with all their foibles unless they were grossly corked or oxidised, in which case we called for a second bottle. Your wine writing wine career ? My decision in 1988 to divorce my wife ,the law and marry my mistress, wine, left me without as they say any visible means of support. 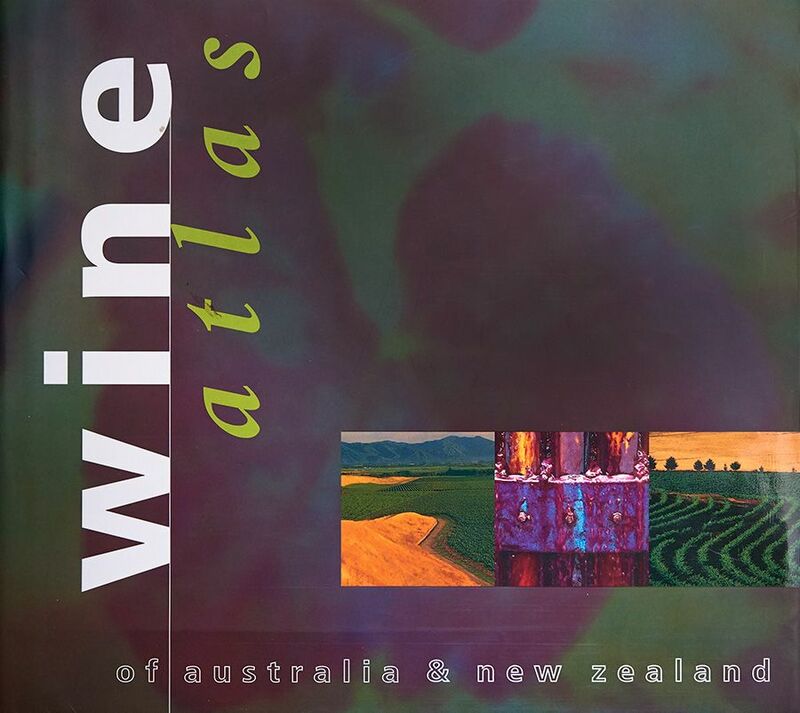 Jame’s Wine Atlas 1998 with three of my images on the front cover. My income as a wine writer helped. Luckily I had been in the right places at the right times as a wine writer and author since day one. Thus every newspaper article, every magazine contribution, and every book I wrote was commissioned by the various publishers, and I have been paid for all my writings. My first magazine article was written for Epicurean in 1970 at the request of its editor and there’s never been a time since I’ve not written for magazines, sometimes two or three at a time. Between 1978 in 1984 I wrote a weekly column for the now defunct National Times. In 1984 I was headhunted for The Australian at the suggestion of Len Evans. Len Evans. Photo : Milton Wordley. Len had the ‘Indulgence’ column on the back page. I got part of the inside back page section called ‘Overindulgence’ but it didn’t last very long. Since then I’ve contributed a weekly column to The Australian. At one glorious time I had 1500 wards a week, now it’s shrunk to around 550. News Corporation commissioned the biblical length Australian Wine Compendium 1984, which led to the annual Australian Wine Guide, which in turn eventually morphed into the Wine Companion. On average, I have written (or made a significant contribution to) over two books every year, the total now over 70. This is never-ending, reflected by Platinum status with Qantas and Silver with Singapore Airlines. I travel business class which allows me to work, and is (of course) more comfortable. Greatest Australian and non-Australian wine you have tasted ? 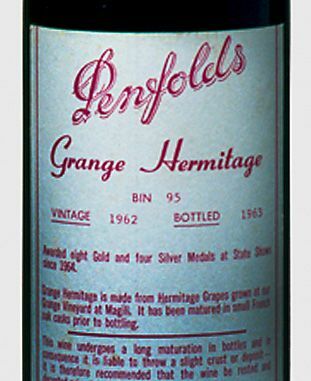 Greatest Australian Wine: 1962 Penfolds Bin 60A. : I’ve had it many times in fact I’m planning to take my last bottle along to the SBC dinner we are planning in the Yarra Valley. Peter Gago introduces Camilla and Prince Charles to Penfold 1962 Bin 60A. Photo : Milton Wordley. 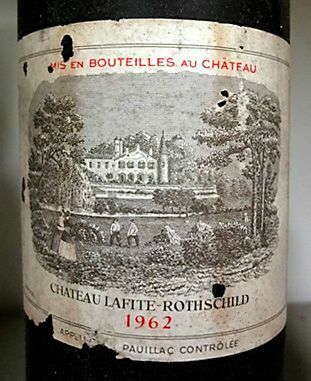 A tie between 1865 Chateau Lafite (ex double magnum) and 1929 Romanee-Conti (ex magnum). 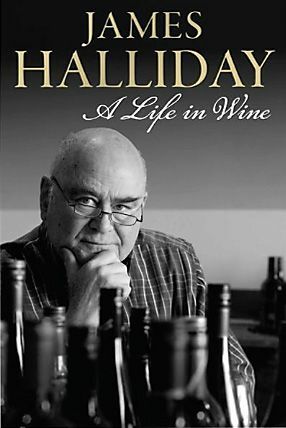 Your book the ‘Halliday Wine Companion’ is recognised as the most influential wine book in Australia. How many wines do you taste, how long does it take and how big is the production team. Australian Wine Companion: this year 8953 wines were tasted, Campbell Mattinson tasted 2595, Tyson Stelzer tasted a small number of sparkling wines, I tasted the remainder. James in his tasting loft : Photo Supplied. I taste throughout the year (Harbour Bridge stuff), with peak periods during September (tasting for the Weekend Australian Top 100) and then January 1-May 1, with a 7-day 7am-7pm tasting cycle each day interrupted for a brief lunch and then a dash to the office between 3.30-5pm before returning to continue the tasting until 7pm. Because I was writing two books this year at the same time (Varietal Wines was meant to be finished before the end of the year, but that didn’t happen), the tasting regime was especially vicious, running for weeks on end without a single break; there were just enough breaks to get me over the line, and this coming year I plan to limit the tastings for 6 days a week, not 7. The production team is Beth Anthony (who does all the heavy lifting, unpacking and entering the wines into the database, and stewarding for me as I taste through the day), and earth mother Paula Grey (who wrangles my handwritten tasting notes into the database and then persuades the database to align the stars of wines and wineries into book form). 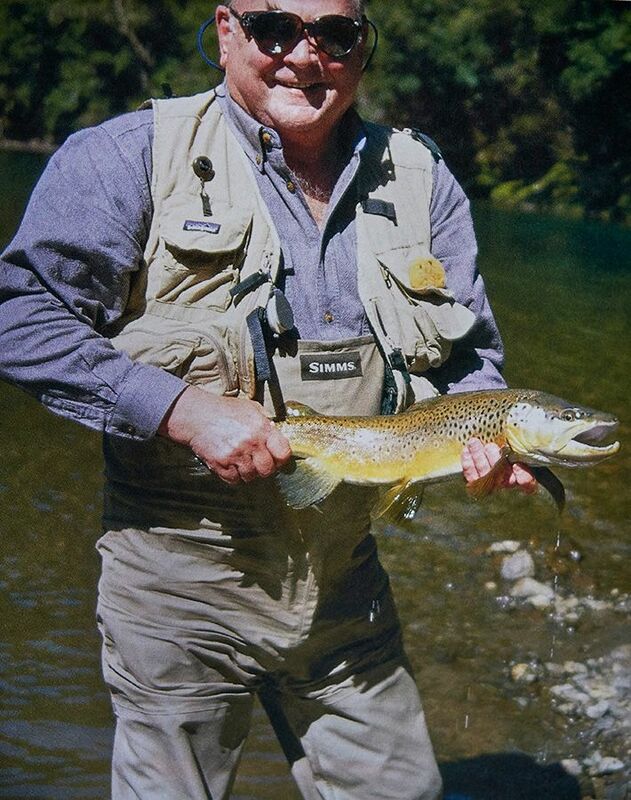 Fly Fishing: hitherto only for trout (60 years), but extending to bone fish and tarpon for a once-only trip in the first week of September to Cuba. Cricket and Rugby Union are compulsory spectator sports, and I do have an interest in photography and rare postage stamps. I’m riding a tiger and can’t work out how to get off safely. But I do plan to gradually get further assistance with the Wine Companion and lessen that workload. That said, I need the money. What does Australian Fine Wine look like in the future ? You have to realise that pinot noir and chardonnay really only came on-stream to any significant degree in the 1980s, ditto most of the cool climate regions, which also produce lovely shiraz. The rest of the wines will come from long-established regions such as the Barossa Valley and its treasure trove of vines over 100 years old. That’s on the production side. On the demand side, Asia, led by China, will absolutely dominate the fine wine trade throughout the world, with Australia having the box seat. Shanghai Launch of the 2015 Penfolds Collection : Photo Supplied.